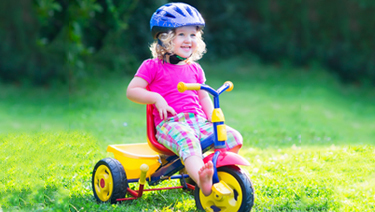 Healthy Children > Safety & Prevention > At Play > Ready for a Tricycle? As your child outgrows babyhood, she will want a tricycle of her own, and when she gets one, she'll be exposing herself to a number of hazards. For example, a child on a tricycle is so low to the ground that she can't be seen by a motorist who is backing up. Nevertheless, riding trikes and bikes is almost an essential part of growing up. Don't buy a tricycle until your child is physically able to handle it. 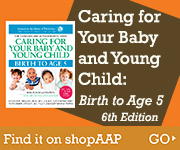 Most children are ready around age three. Buy a tricycle that is built low to the ground and has big wheels. This type is safer because it is less likely to tip over. Obtain a properly fitting bicycle helmet, and teach your child to use it every time she rides. Tricycles should be used only in protected places. Don't allow your child to ride near automobiles, driveways, or swimming pools. In general, children don't have the balance and muscle coordination to ride a two-wheel bicycle until around age seven. Most children can safely begin to ride a two-wheeler with training wheels after age six, but not before. Again, to protect your child from injury, make sure she is wearing an approved bicycle helmet (certified on the label that it meets the Consumer Product Safety Commission standards).